How Much Will a Tow Cost Me? How Much Are Towing Fees? Millions of vehicles are towed in the US each year. Nearly every car owner has needed at least one tow in their lifetime. Towing fees can be costly if you do not have roadside assistance through your insurance, membership in a roadside assistance group, or an emergency fund set up for cases of, well, auto emergencies. Many people do not realize tow services include more than transporting a vehicle from one place to another. The fees charged by tow companies can vary depending on your circumstances, where you live, and the tow company. Why Would I Need To Be Towed? There are several reasons that you might need to employ the services of a tow truck, and thankfully, several of them are avoidable – but many are not. If you are in an accident and your car is damaged to the point that you cannot drive it, or if your car has a problem that keeps it from starting, you’re definitely going to need a tow truck. But the most common reasons for needing a tow truck are avoidable. Have you ever left your lights on accidentally and killed your battery? Keeping a pair of jumper cables in your trunk could help you avoid making the costly call. Likewise with keeping and knowing how to change a flat tire for a new one and keeping an eye on the gas gauge. Finding a mechanic nearby could really help reduce the cost of your tow. What Services Do Tow Companies Offer? Keys locked in the car is a common occurrence for many. Calling a tow company to help can save the day. Check out the other services that are often available from a tow company. What Impacts the Cost of a Tow? If you check directly on a tow company's website for pricing, you will probably be hard-pressed to find a dollar amount. I checked several and not one listed their prices. However, luckily the cost of a tow is fairly standard so I can at least give you a ballpark figure. Towing fees often start at $50 and can quickly get as high as $100 depending on the type of tow and where you are located. Often the base fee or often referred to as a hook-up fee is $50, regardless if you need your vehicle towed one mile or twenty. More mileage does often come with a higher price tag. A standard tow is usually cheaper than a flatbed tow. A tow due to a car accident can be substantially higher. The cost of having your vehicle towed and impounded can also be a lot higher. Roadside assistance can seriously come in handy at a time like this. Options for roadside assistance coverage vary from policy to policy. Some car insurance carriers offer $50, $100, and $150 limits of coverage. The dollar amounts of coverage can come with a mileage limit too. For example, $50 of coverage for up to a 20-mile tow. Sometimes mileage is what the coverage is based upon instead of a dollar amount. 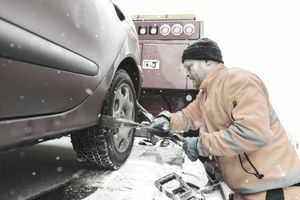 Some insurance policies may be set up to cover a 100-mile tow regardless of the amount of the charge from the tow company. It is important to understand your coverage at the time you purchase it so you are not confused about how much is covered and what to do at the time of a loss. If your vehicle needed to be towed after a covered loss accident, most likely your car insurance policy will cover the cost of the tow within your claim, even without having selected roadside assistance. It is a nice coverage to have since a tow at the scene of an accident often cost a whole lot more than a standard mechanical problem tow. If you have questions about your roadside assistance coverage, you should call your car insurance agent. Sometimes your agent may be able to file your claim for you and have a tow truck sent out to your location. It all depends on your policy. Hopefully, you will be on your way in no time with a quick call to the tow service, just make sure to keep your receipt if you hope to file a claim on your car insurance. Not all roadside assistance is created equal -- or provided through your insurance agent. AAA, which generally costs less than $100 per year depending on your state, includes 100+ miles of free towing for around 4-5 tows annually. Hopefully, you don’t need to take advantage of it that often! But if you do, you’ll breathe a little easier knowing that you’ve already paid for this perk. Such membership groups also include perks such as jumps if your car battery dies, discounts on hotels and other travel destinations, and even loans and banking services. Are You Protecting Your Rental Truck? Is Stated Value Insurance the Right Coverage for Your Classic Car? Is There Still Time to Buy Gap Insurance?